Certain artists would have you believe that sandwich stall owners do not have to wear paper hats. I disagree. The NPCs in this comic are purely fictional. Any resemblance to actual Northerners, especially certain Canadian friends of the artist, is purely coincidental. lol, i thought he was gonna steal sandwiches…and btw, did u see my fan art?? 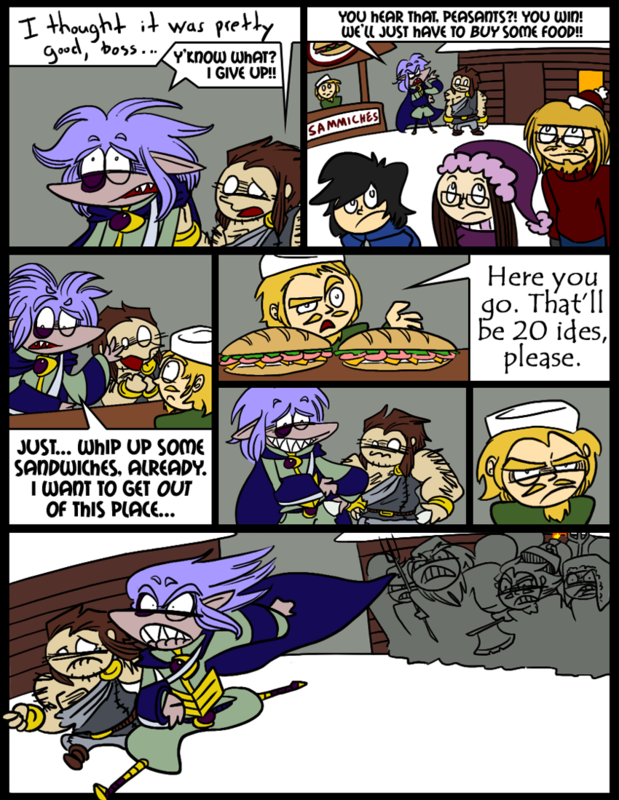 20 ides?! But we only get one a month! Icee the wizard from the temple for sure this time,riot at the front of the crowd…..OMG THIS IS SO COOL HE HAS A PITCH FORK! *ahem* well im gonna lay down,were having a heat wave here,so im just gonna go dive into the artic ocean,I might get down a full 2 degrees! That guy is WAY too tall to be the wizard, silly! Is that an author cameo in Panel 2? Nope, they’re all Canadians! The girl is my old friend Cubie. The guy on the left is BanjoBoy/Conkertheking, and the guy on the right is a friend from college band (who somehow wound up coming from Canada to Houston). Who is that awesome dude with the santa hat and glasses? You should bring him back. His face on the last panel is epic! So glad I found this web comic lol i am hoping that is better than most. It’s the Maple Syrup cabin guy again! He’s leading the mob, again! He just does not like Skarva at all, huh? I mean, I’d be mad if someone tried to take MY maple syrup. Omg Dook. It makes me so happy you’re reading the comic. ;_; And yeah. If they ever go back here I’ll put you in too!